Chicken and four ingredients for a sweet and savory melt in your mouth flavor is my go-to dinner on busy nights when I don’t have time to cook! This recipe is from trim&TERRIFIC Eating Well to Fight Arthritis. Preheat oven 375ºF. Line baking pan with foil and coat with nonstick cooking spray. In bowl, combine all ingredients except chicken. 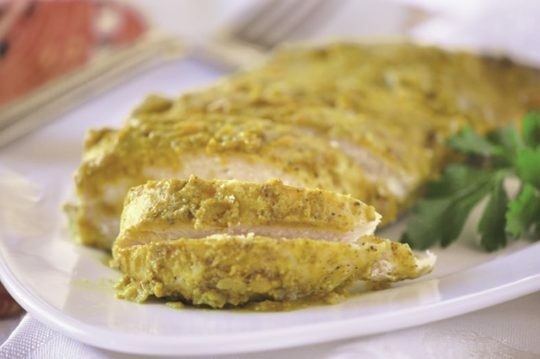 Coat chicken in curry sauce, place chicken on pan and pour remaining sauce over chicken. Bake 40-45 minutes; turning chicken halfway through, cooking until chicken is done. Nutrition Nugget: Curry has ingredients that have been found to have anti-inflammatory properties helping to reduce arthritic pain. For more of Holly's healthy recipes and tips, visit her YouTube channel, website and blog.